You’ve just launched the best crowdfunding project ever on Kickstarter. And within what seems like minutes, you receive dozens of messages from marketing agencies and individuals who make pitches to you about promoting your product. Often, our clients are overwhelmed by so much attention. They scramble to figure out which offers are legitimate - because they all sound fantastic - and then, which (if any) they actually need. As a guideline for every creator, I’d like to make sense of these offers for you. First off, there are only a handful or so legitimate crowdfunding marketing agencies on the market. In addition to Funded Today, agencies that are reputable enough to be worth considering are Jellop, Eventys, Agency 2.0 and Matix. Just like us, these agencies have strengths and weaknesses, a number of successes and failures - but they have a positive reputation within the industry and they won’t just run off with your money. There are a number of black sheep in the crowdfunding marketing space, and by choosing one of the five agencies I just mentioned and passing on those not listed, you are on the safe side. But now that your choices are narrowed down to five full-service marketing agencies, what is the next step? Do you hire one? Or multiple? Or all? We’ve crunched the numbers of hundreds of our clients who have all raised at least $50,000 with us - and we’ve got a strong suggestion for you. Funded Today has, as of March 15, 2018, raised over one million dollars with exactly 37 different clients. Of these campaigns, only eight (or 21.6%) had hired another agency besides Funded Today. Of the 12 campaigns that raised over two million dollars, only one (our eight-most funded campaign ever) had hired another agency. That’s only 8.3%. In the segment between $750,000 and one million, 50% of the campaigns we worked with had hired another agency besides Funded Today. In this segment, we also find the highest-raising campaign that worked with at least three agencies, in 40th spot of all Funded Today clients overall. One segment lower, between half a million and $750,000 (yes, we’re still in the top 0.1% of all Kickstarter campaigns! ), nearly 50% had also contracted with another agency, and about 25% of clients in this segment had hired three or more. The next quarter-million dollar section is quite exhaustive already, as more than 100 of our clients have raised between $250,000 and half a million. The trend here continues, with now more than half of campaigns bringing on an additional agency - and again, some 20% of campaigns hiring three or more agencies total. 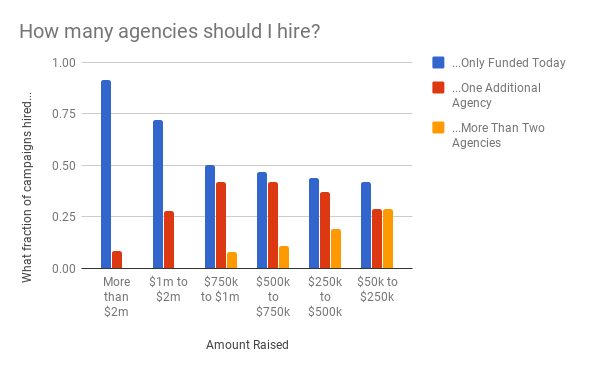 In the final segment we chose to look at, between $50,000 and a quarter million, we find that now nearly 60% have hired more than one agency, and almost 30% have hired three or more agencies. If your head is all dizzy from these many numbers, let me point out a rather striking trend that is also illustrated in this chart displaying the percentage of campaigns in each total raise segment that hired multiple agencies. Now, all of the campaigns we analyzed were strong campaigns. Only about 5% of all projects on Kickstarter raise at least $50,000, and for Indiegogo, the fraction is even much smaller. But as this data set of 567 campaigns illustrates, our empirical suggestion for you is to put all eggs into one basket, with an agency that is versatile and delivers one complete marketing package. Million-dollar campaigns, rare as they are, are made from the fabric of strong and dedicated partnerships, and not from hiring everybody. Follow along, as in an upcoming blog post, we will be discussing how to choose the ideal crowdfunding marketing partner for your campaign. About the author: Pascal Friedmann joined Funded Today in the Fall of 2016, having previously spent time in marketing for insurance and political campaigns. He is Funded Today’s only former Earned Media and PR Director, and he is now in charge of special projects.